Shopping for Twilight Zone Bobble Heads? Look into the future... with the Mystic Seer! SDCC Exclusive color variant from the The Twilight Zone. This amazing wobbler from Bif Bang Pow! includes fortune-telling cards! Limited edition of 1,500 pieces. Entertainment Earth Comic-Con San Diego 2010 Exclusive! 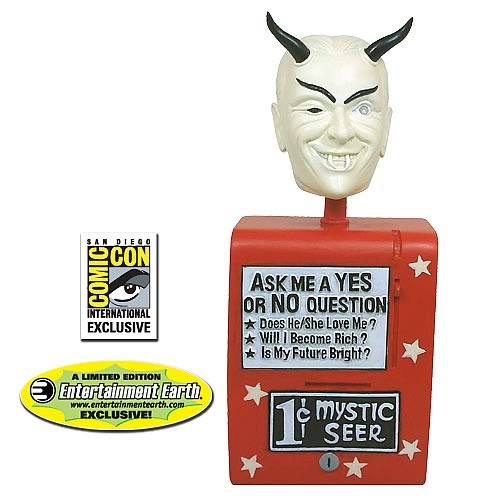 Based on the classic The Twilight Zone episode "Nick of Time" that starred William Shatner, this terrific Mystic Seer Bobble Head is a color variant that measures about 7-inches tall x 3-inches wide x 2 1/4-inches deep. It's a limited edition of 1,500 pieces that even includes fortune-telling cards as part of the packaging! Wouldn't this look great on top of your TV set? "The hand belongs to Mr. Don S. Carter, male member of a honeymoon team on route across the Ohio countryside to New York City. In one moment, they will be subjected to a gift most humans never receive in a lifetime. For one penny, they will be able to look into the future. The time is now, the place is a little diner in Ridgeview, Ohio, and what this young couple doesn't realize is that this town happens to lie on the outskirts of the Twilight Zone." Note: This item is a bobble head; it is not a full-size working replica of the Mystic Seer. Star Trek: TOS 24kt Enterprise Monitor Mate - Conv. Excl. Star Trek: TNG Sherlock Holmes Bobble Heads-Set of 2 Excl.